Little DinoEgg went to Hort Park with the school and he came back with this cute little pot of something. Honestly, I have no idea what plant is this, no use asking him too coz he will not know it. I have always wanted to go there with Little DinoEgg but the distance and hot sun sort of puts the idea off. I tried to get some info from him but all he says is "There is nothing much to do there! Walk walk walk till my legs are going to break!" He continues "Then we plant this plant. First we put the soil, then the plant, then cover it with soil. We have to give it Sun and Water you know." He quickly proudly says "Its my responsibility to take care of the plant!" 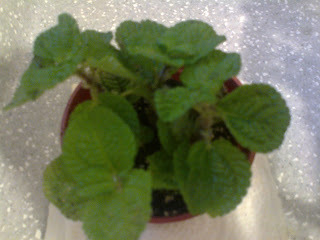 I hope this plant will flourish n flower eventually. Let's see how long Little DinoEgg will be responsible towards this little pot.